This is my first Nosy Crow book. I’ve come across the work of Nosy Book a lot already, what with loving their blog and their books when I’ve seen them (and, er, borrowed them) from the hands of my friends and relatives children. And the thing about them, the standard brilliant thing about them, is that they’ve all been really good. High quality books lovingly produced which are all, to be blunt, really really good. Trust me when I say it’s taken me too long to get to reviewing a Nosy Crow book and it really shouldn’t take you as long as it took me. 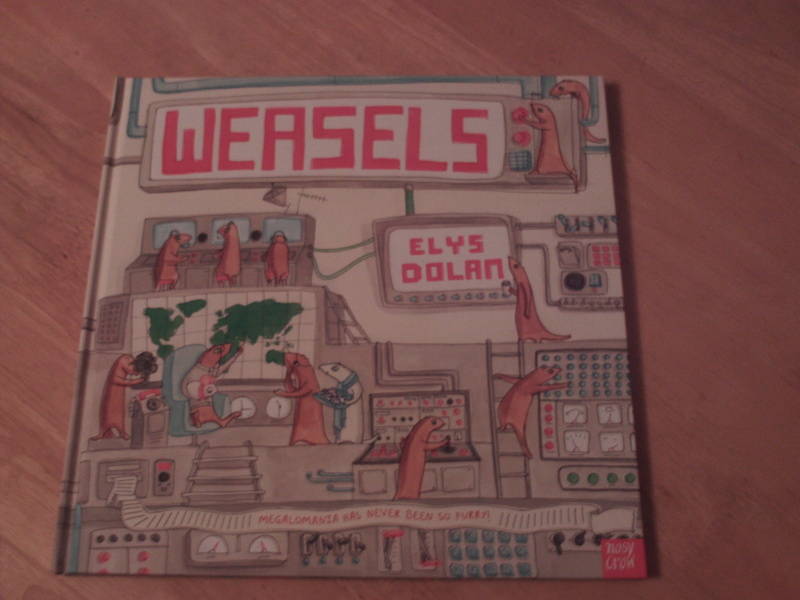 I am beyond happy that my first is Weasels by Elys Dolan. 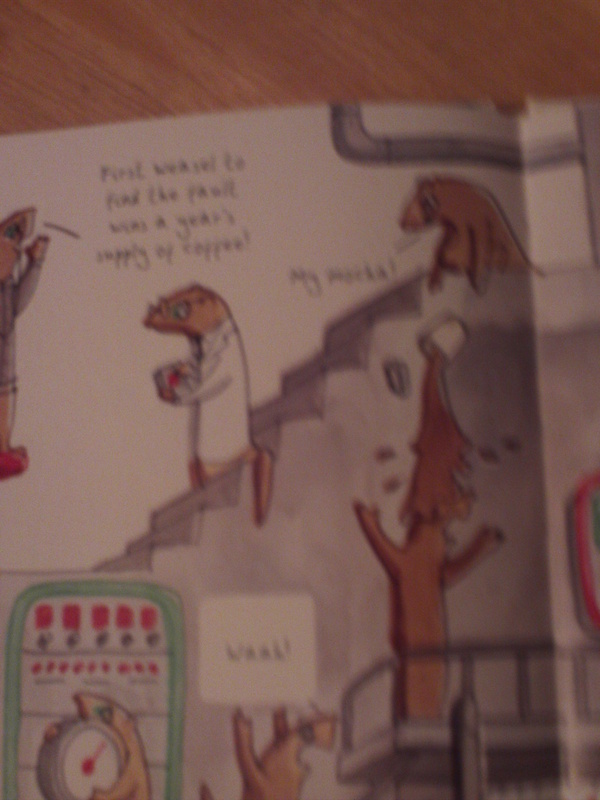 This Bletchley-Bond-Hank Scorpio hybrid of a book which features the titular weasels throughout is very, very good. 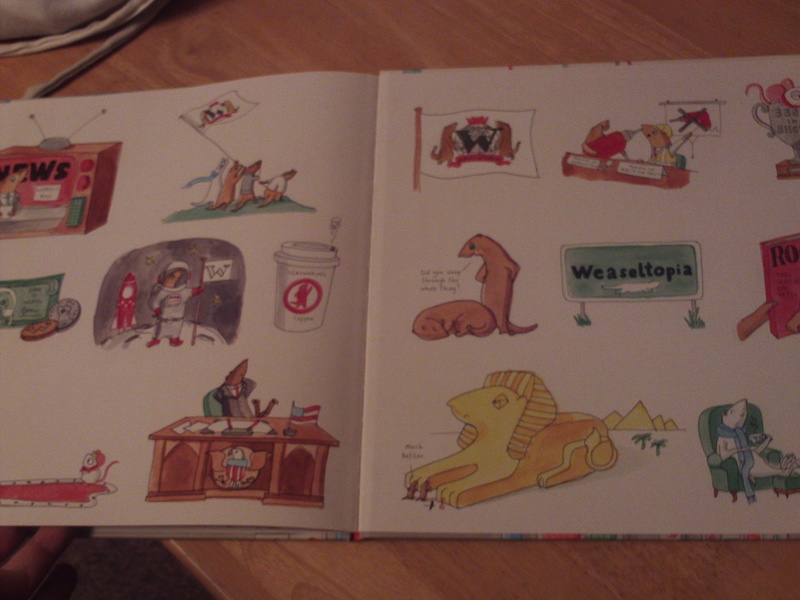 And, I think, it all starts on the front cover (fig 1) as good picture books like these tend to do. See those weasels? They’re made of a slightly shinier paper than the rest of the front cover and what that means is they are tactile. You feel the weasels and see them catching the light on the front page. The title and author are done in the same shinier paper. Remember, in these books, it’s all about the incentives. We want these books to be read and dwelled upon. We want these books to be touched and pawed and combed over, and it’s the simple things, the simple yet madly clever things such as making the weasels stand out, that do that. This is clever, smart production. And production matters, and it matters so much because it shows value and respect and belief in the contents of the book. The content of Weasels is content worth dwelling on. And it is. And you’ve got that all just by closing your eyes and running your finger over the front cover. So let’s open our eyes and actually have a look at the book itself. There’s a lot going on here and it’s a book that rewards rereading. It rewards dwelling on and tracing all of the narratives threading through. You know that person you know who says picture books are easy simple things? They’re not. They’re possibly one of the hardest forms of children’s literature out there. I really loved Dolan’s art in this. It’s so clever in the smallest of spaces. She’s got a real gift for the moment, capturing the awkward, the funny and witty all in the briefest of beats. She gives you so much and never, ever goes for the easy way out. In one scene in particular, where the lights go out, we have one weasel saying with a bit of bemusement, “Why is there a wet patch here?” and then, in the next spread, we see the white weasel (a beautiful recurrent thread throughout the book) nonchalantly whistling as it clears up a broken mug. And the coffee! Oh God, the coffee! There’s elements of this book that are beautiful and brilliant and very cleverly aimed for the adults to enjoy and I think that one of those threads is coffee. I refer you in particular to Fig 3 (which, though the picture is a little rubbish, I hope you can still make out). It’s one of many, many equally glorious moments throughout this book but this genuinely had me cracking up. It’s something about the way the top weasel goes “My mocha!” and the bottom one is just caught in his appalled reaction. This book is very lovely and very good. I hugely reccommend it, and I’m so glad I finally broke my Nosy Crow weasel duck. You can read previous picture books in depth posts here, and there’s a really fascinating post from Dolan here on the creative process behind Weasels. « #readyourwayaroundtheUK – an update, a thank you and a challenge! We love this book too! If a book can have your 4 yr old saying ‘can we have that weasel one again’ ten times a day, plus make you snort your coffee out your nose with laughter, AND work as a book to share with your team in the office, then I think it’s a winner! Lovely (and beautifully written) review of one of our favourite books. Wait for Nuts in Space next April! Okay, I am sold on that title alone. *marks the date* Thank you! Pingback: Nuts in Space : Elys Dolan | Did you ever stop to think and forget to start again?